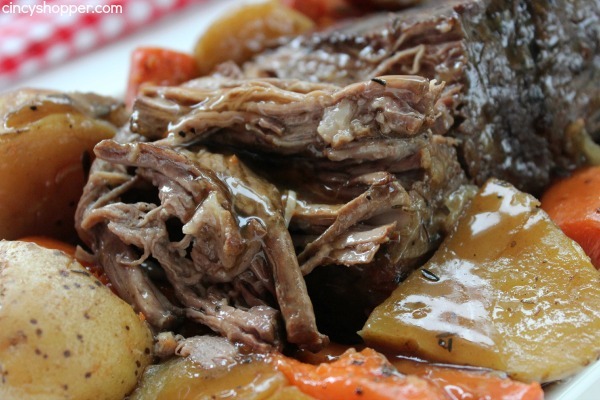 No need to turn on the oven with this Slow Cooker Pot Roast recipe. 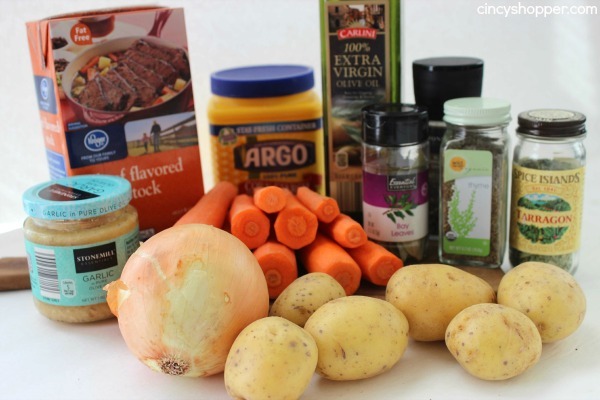 This roast loaded with potatoes, carrots, and onions is an easy Crock-pot idea that makes for a filling meal. Juicy meat with incredible flavors. Prep it, toss in the slow cooker, and return later in the day to a great family meal. During the summer months I hate heating up the house with a roast that needs to bake all day long. Making quick and easy meals or Crock-Pot Meals for dinner is frequent. While doing my grocery shopping this week, I spotted a nice roast on a managers special. It was a pretty good deal so I decided to purchase. We have been eating quite a few cold sandwiches like our CopyCat Panera Tuna Sandwiches for dinner lately so a big piece of beef sounded great. Since beef has been so pricey lately, I have also made our Slow Cooker Meat Loaf a few times since the warm weather arrived. Ground Beef has been expensive but big steaks and roasts have been crazy pricey. 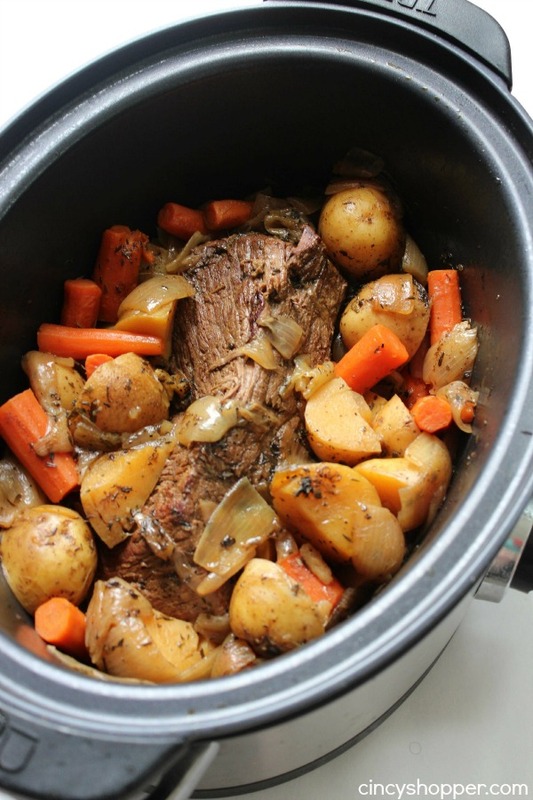 Crock-Pot meals are perfect for making in the morning to have ready before dinner time. I just prep and toss it in. Then I can head off for the day and not have to worry. 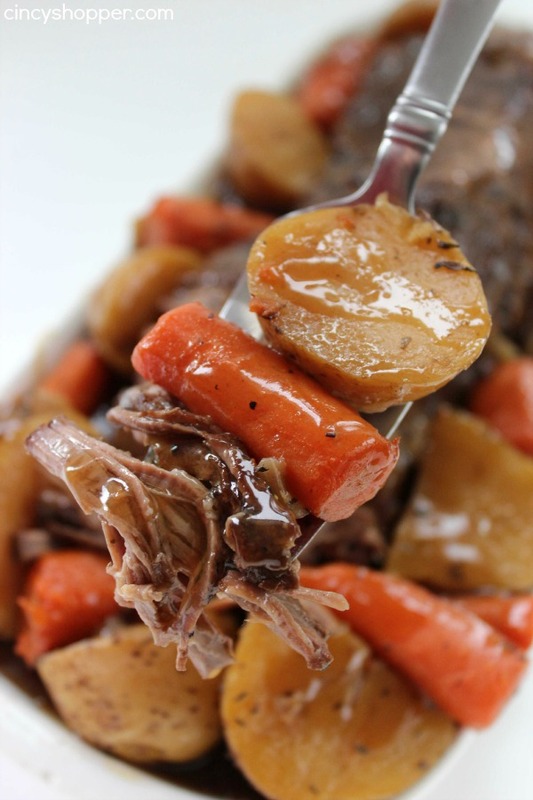 This Slow Cooker Pot Roast dinner was perfect. I let it cook all afternoon and it’s ready when we get back from our daily outings. 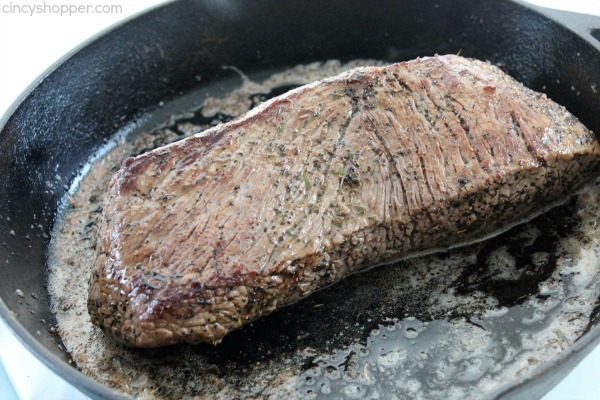 I have cooked this recipe a few times and each time the beef turns out so tender and flavorful. The gravy addition adds some extra flavor and my family loves it. 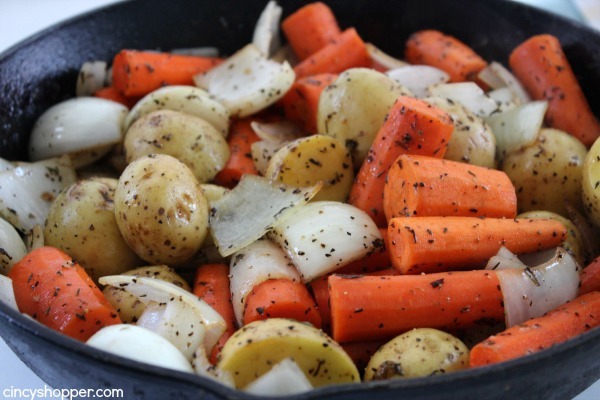 The potatoes and carrots are great sides and I like that this dish serves my large family. 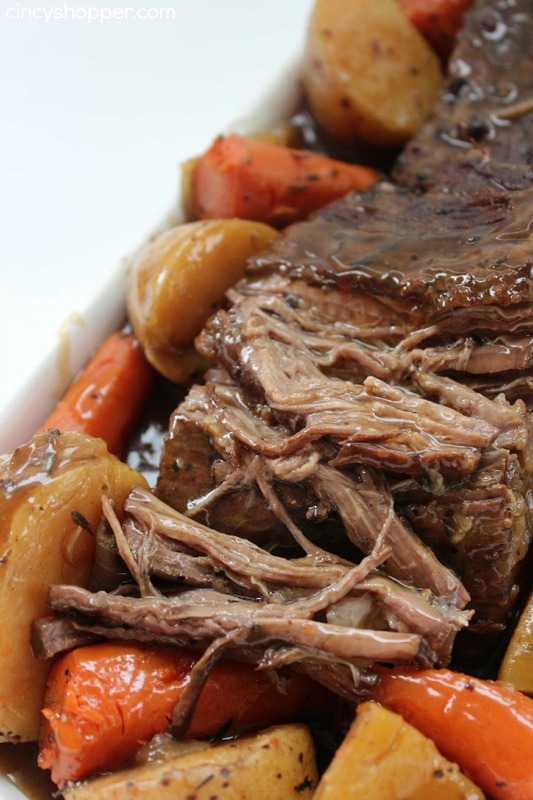 This Crock-pot Pot Roast requires a few ingredients and a little bit of prep. You can save time with prep by purchasing pre-cut veggies. I do that occasionally to save on time. Beef, veggies, stock, and a few spices from your pantry is all that is needed. 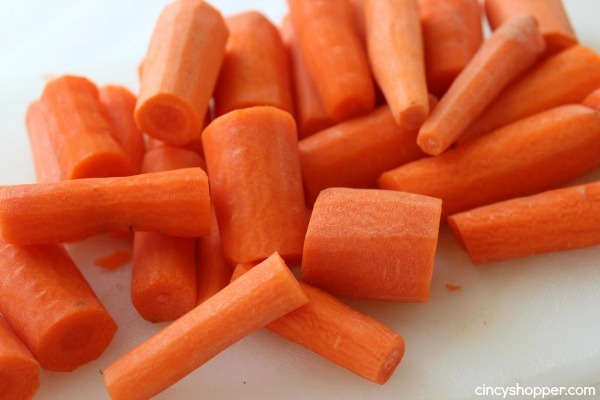 Peel and cut carrots into 1-3″ pieces. 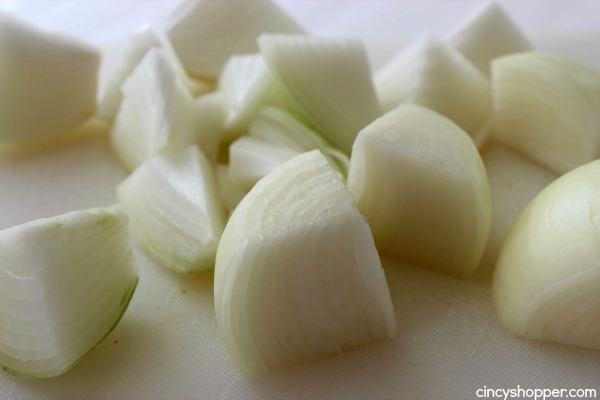 Peel and cut onions into 1-3″ pieces. 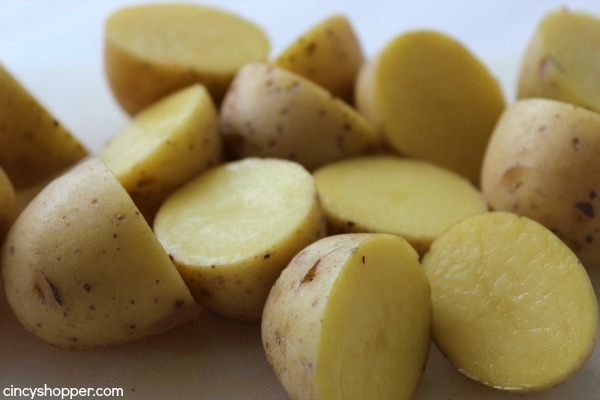 Wash and cut potatoes into 1-3″ pieces. Mix together salt, pepper, thyme and tarragon. Rub roast with olive oil and cover with about 2/3 of spice mix. Heat skillet over medium high heat and brown on all sides. Transfer roast to slow cooker. Lightly coat vegetables in olive oil and season with remaining spice mix. Add some stock to skillet and stir to deglaze. Pour liquid into slow cooker. 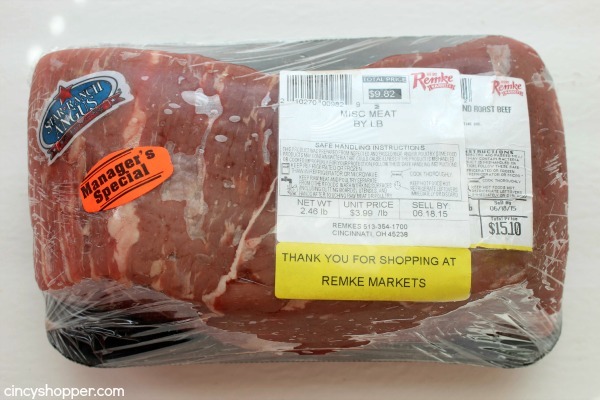 Add remaining stock to slow cooker. Cook on high for 5 hours or low for 10 hours until vegetables are tender and meat pulls apart easily. Transfer meat and vegetables to serving dish. Pour liquid in sauce pan and heat. Mix cornstarch with an equal amount of water and stir until well blended. Add cornstarch mix to sauce and heat, stirring frequently, until sauce thickens. 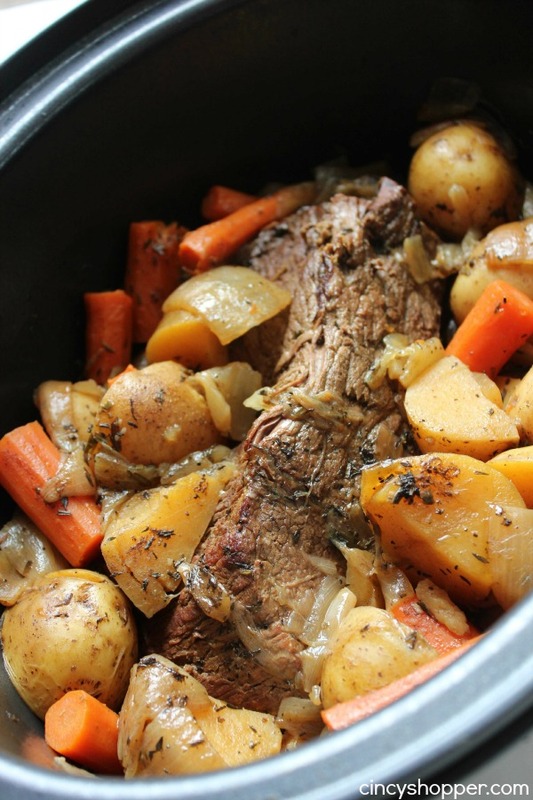 This slow cooker recipe will be great for summer months when it is too hot to be turning on the oven. In the fall, this meal will make for the perfect comfort food to keep you warm on a cool day. 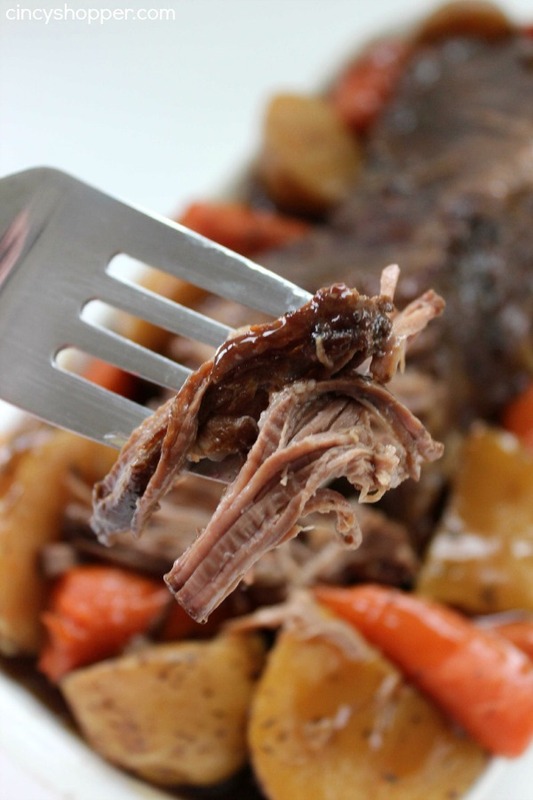 Do you have a favorite slow cooker family meal? 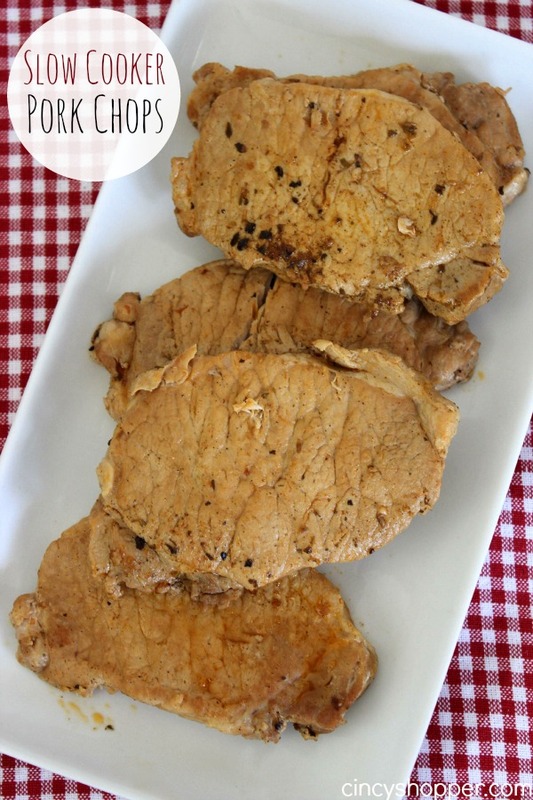 This one has been on our meal list for awhile now and we love it! Peel and cut carrots into 1-3" pieces. Peel and cut onions into 1-3" pieces. Wash and cut potatoes into 1-3" pieces. Pour liquid in sauce pan. and heat. I’ve read the recipe over several times and can’t seem to see where it says to add the garlic. christie : Place vegetables and garlic in skillet and cook stirring frequently for 5-7 minutes. Step 9. Where it saYs to place veggies and garlic in skillet and cook while stirring frequently for 5-7 minutes. It says to place the vegetables and garlic into the skillet and cook, stirring frequently for 5-7 minutes. What size crock pot is the minimum for this? Like Christie above, I don’t see where it says to add garlic and veggies to skillet and cook for 5-7 minutes. I printed the recipe out and if following that way, I’m not seeing it on there. What am I missing? It’s all already in the crockpot, so I hope it still tastes right. Also, is it supposed to be covered in the beef stock? That much stock covers almost everything. Seems like a lot! Can I cook this on low for 8 hours instead of 10? I didn’t get my ingredients ready in time for a 10 hour cook time. Attempting it, but wondered if anyone has ever tried this in 8 hours. I did it for 10 hours last time and it was PERFECT. Concerned about 8 hours. Thanks! Apparently there is some missing text on this page. I searched all of the matches for garlic and found nothing about Steps or placing veggies and garlic in skillet so I wonder other instructions I might be missing? WHAT SIZE CROCK POT …. AND WHAT CUT OF BEEF . I’M ASSUMING A 3 QUART … AND ANY POT ROAST ????? Just wanted to say that I made this today for dinner and it was great!! I used a 3 pound Chuck pot roast with a 4 quart slow cooker and with the size of my crock pot, the 2 pounds of potatoes and pound of carrots didn’t fit. Neither did all 32 ounces of beef stock. Judging from my experience the recipe maker has a larger slow cooker than me. All in all it came out wonderful. Smelled amazing while cooking and the whole family loved it. I added some garlic powder, onion powder and dried oregano to the seasoning and omitted the tarragon. Thank you for the recipe! I’ll definitely be saving it. The picture with all the ingredients shows bay leaves, but not mentioned in directions. Do you use those? I love using my slow cooker year-round too! Such a sanity saver knowing that dinner is already set and I just have to serve it up. 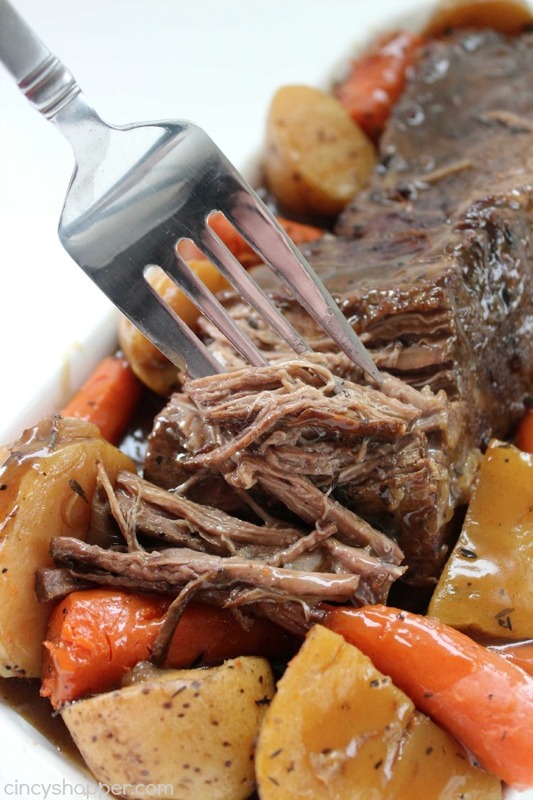 This pot roast looks like a crowd pleaser for sure – yum! IF I wanted to freeze this meal, would i cook it first or put ingredients in bag? Thanks so much for joining us at Delicious Dishes! 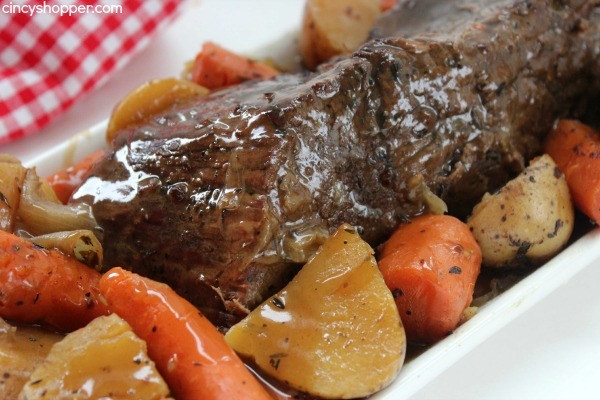 We love your Slow Cooker Pot Roast recipe and hope you’ll join us again this week! Yum. That was one good recipe. Here are my comments and personal modifications. First, I don’t like tarragon so I substituted it for Italian herbs. As for the mysterious garlic, I put it in the spices mix. For those wondering when the bay leaves go, I think they go in the slow cooker when cooking the meat for 5 or 10 hours. Also, I added butter to the pan when browning the beef and pre-cooking the veggies. Overall, there are a lot of steps in this recipe, but it’s really good, especially with an extra glass of red wine. Interesting of of spices like Tarragon. Thanks. Will add to my recipe ideas. great recipe. 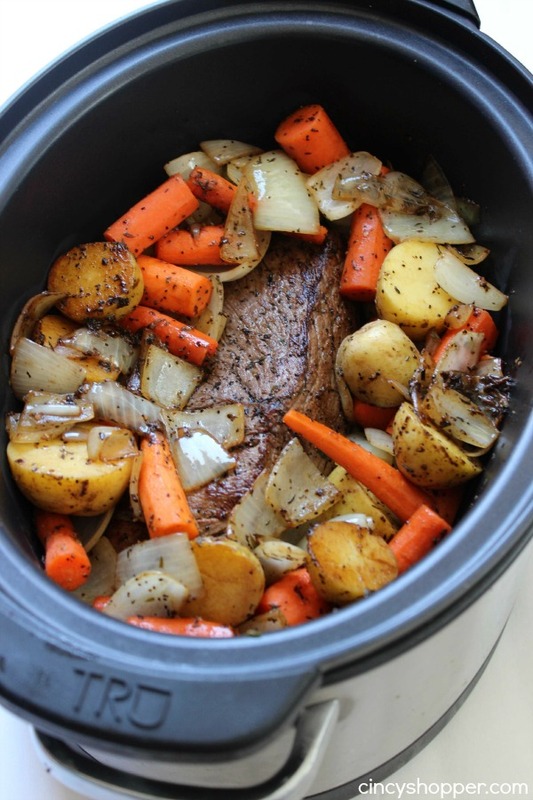 This roast loaded with potatoes, carrots, and onions is really looking so delicious. Thanks for putting it together. Any substitute for olive oil? Has anyone made this with a venison roast? Just wondering if it would be an equal substitute for beef. Thanks! I didn’t notice until after I put everything in the crockpot already that nowhere in the directions does it mention garlic. I’m not sure where everyone else is seeing it. I ended up just putting it in afterwards. I can’t see that making much of a difference but i’ll find out in 10 hours. Hello! 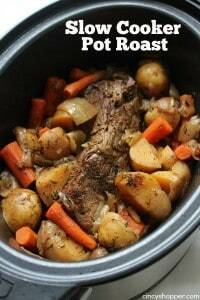 How many servings does the crock pot roast make? I think this recipe has been edited a few times. I didn’t see anywhere in the instructions of where to add the garlic. People in other comments are mentioning the step to add the garlic and vegetables to a pan, which isn’t in the recipe. Someone else mentioned bay leaves, which aren’t part of the recipe. This is in my 6 quart Crock-Pot now. I didn’t have tarragon so I substituted oregano. I missed adding the garlic because it is never mentioned in the instructions nor is sauteing the vegetables before adding them to the roast. The Crock-Pot is filled to the brim. I can see having to dip out part of the liquid to keep it from boiling over later. We shall see.